A codex in Eddings terms is a document that recorded the selected ramblings of nutters who didn't know what they were talking about. This page is probably going to be very similar in content so I thought it appropriate to call it a Codex. These pages will contain a number of things but the common link is that it is all related to the alt.fan.eddings newsgroup. Basically I hope to explain a little of what the newsgroup is like, who the regulars are and some of the more interesting things that have occurred recently. Kalten's "The Book of the Heavens"
'Cap' Miller, Klael and Walker. The number of characters now stands at 39. "The newsgroup is a magnificent epic of immense scope set against a history of four or five years of the struggles of posters and Trolls and spammers - of strange ideas and quizzes - of a Goddess and a wolven prophecy that must be fulfilled." I think that there was about 120 messages before I started reading - mostly because of the way the newsserver I was using at the time was managed. Gosh, that would be bakc in Autumn '92, or was it a year later? It was certainly around the time that they started letting us post directly from our workstations (without jumping through 10 magic hoops, and sacrificing a goat or two for luck... :^)"
So there we have it, Autumn 92 or 93. Could anyone pinpoint this exactly? Update: See the bottom of this history for more infomation. In this document I will recount the recent history of the newsgroup. I was born into the world of alt.fan.eddings during the absence of a certain wolven character known only as Rumor. The reason for his absence was a huge argument that had erupted over the question "Who died at the end of the Mallorean?". From what I can gather Rumor asked no one to post the answer as it was a spoiler, but someone hadn't seen this and posted the answer. I am glad to report that both parties apologized but Rumor decided to leave the newsgroup. There were many that called for his return. A determined female divinity sought the counsel of the people of the newsgroup and many of the regulars signed a petition that called for his return. Rumor eventually capitulated and returned. He became the High Priest of the Goddess Aphrael (for mammals only I might add). Peace came for a time to the newsgroup. It was much like it is today, except there was more of what was described as "banter", a word much praised in Eddings works as part of the humour of the characters. David Eddings would have said something like "Peace reigned for many months in the kingdoms of the west". Aphrael recruited some more priests to look after the human side of the newsgroup. Ironically there had been much talk at the time about various newsgroup terms and the meanings of certain phrases such as "spam" and "trolls". The name of the poster has been lost to the wastebin of a windows crash but the repercussions live on. Basically all the initial poster said was that Durnik had to be the most boring character of all time. Someone leapt to Durnik's defense and said that the newsgroup had been a victim of a "troll". Things went downhill rapidly as the original poster responded to this and then Rumor bared his fangs. Suffice to say, it was the first of two flame wars the newsgroup has had since I've been here. Eventually things calmed down and everyone was very wary for a time. I think this started when Rumor resigned his post as high-priest (I'm not sure why - possibly due to the Durnik Incident) and Aphrael recruited for replacements. For the full story of the priesthood, visit Aphrael's Isle and find out who has and who hasn't been at one point a High Priest (and getting a "Cel" in front of their name). The whole ethos of the priesthood seemed to be based around the sort of friendly banter that was a constant through all of Eddings books. (For an example, take any book and find a chapter where Silk is in a room with either Belgarath or Barak. Or take any scene with Beldin in it). It started fairly lightly, a few bits of one-upmanship, mainly between Aphrael and Rumor. Most of the regulars joined in and the newsgroup enjoyed its golden age (this is "all" IMHO). But somewhere a line was drawn and everyone stepped over it. There was not one post that can be pinpointed as the catalyst, but suddenly the "friendly banter" turned ugly and for the second time the newsgroup got nasty. The fallout was that Rumor left and the newsgroup became very quiet for a long time. The banter was replaced by a cautious approach to posting. A number of new features were introduced to replace the banter, including the ill-fated Character of the Week. The newsgroup seems to be picking itself up again. The ever changing nature of the internet has produced some new faces, and the habit of taking an Eddings alias has grown so much that there are over 100 members of Aslade's Alias List. Simon has revived the Trivia Quiz and even Rumor has popped his head round the door to offer a Wolven Award of Cunning to one of the new recruits. The newsgroup is trotting along quite nicely, Polgara has been out for sometime and, touch wood, there has been a good response to the request for spoiler space to be applied. I, myself, have had little time to post to the newsgroup, I hope that will change in the New Year. Recently, there has been a lot "casting threads" on the newsgroup. Whilst harmless in themselves, when a large number of people start posting the same "Sean Connery as Belgarath" ideas, it does get annoying for the regulars. A lot of work has gone into finding out the origins of the newsgroup. More of this in a later post, but we believe that the esteemed Aquarius has found the answer. Aquarius posted the followed found deep in the archives of alt.config. Where lesser men have failed, the great Aquarius may still triumph. Would you all like to know who actually newgrouped our little ng of fun, and when? A statement of group purpose and why it'd be useful to have follows. issues in fantasy, and fan activities. rec.arts.sf.written has experienced many discussions of David Eddings in the past. Many of these have been "holy wars" involving discussions of whether or not Eddings is a "good" writer; most fan questions have gotten lost in the flame wars and none of the existing rec.arts.sf. * groups have provided a good place to discuss Eddings' works. In addition, it might be beneficial for players of the Belgariad MUSH to have a newsgroup where they can discuss issues and post articles on the current state of the role-playing game (much as alt.fan.pern mixes general Pern discussion with PernMUSH role-playing discussion). This group will hopefully provide a place to discuss David Eddings' novels and the worlds he has created, without subjecting its readers to the volume of postings and the flamage on the rec.arts.sf. * groups. As I say, more of this in the next update. This was not my held belief. 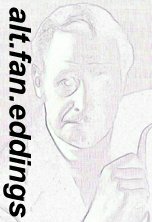 The alt.fan.eddings FAQ is maintained by Aphrael and is posted to the newsgroup twice a month. maintained by Kamion, First Warder of Riva. This contains more than just the FAQ btw, and has lots of good infomation. Check it out. Can you send me the money now please, Kamion? "Obviously based on the Golden Rule and all the things you and I learned as toddlers, along with sharing our toys, and good overall netiquette, not just for a.f.e. Any questions, your own suggestions, or maybe a major gripe, please contact me." 1. Read the articles on the newsgroup for a few weeks or so before you post anything. 1 Thou shalt not flame without malicious provocation. 2 Thou shalt not profane the works of thy author David Eddings. 3 Thou shalt not utilize foul or offensive language. This page has been visited times since September 21, 1998.